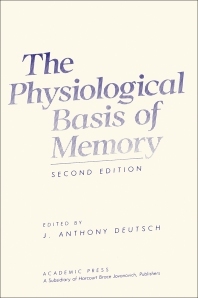 The Physiological Basis of Memory, Second Edition reviews many areas of research that shed light on the physiological basis of memory, from mnemonic function and memory facilitation to synaptic transmission. The book also considers neuropsychology involving animal subjects, learning produced by direct brain stimulation, and the basis of associative learning at the cellular level. This edition is organized into 10 chapters and begins with an overview of the link between protein synthesis and memory, paying attention to studies devoted to chemical changes associated with learning; the effect of inhibitors of RNA and protein synthesis on learning; the molecular code of memory; and the role of proteins in learning. The reader is methodically introduced to the enhancement of memory consolidation; the use of the cellular-connection approach to investigate both non-associative and associative learning; and the effect of depression on memory storage. The following chapters discuss the impact of brain lesions on animal memory; the neurology of memory and amnesia in human and nonhuman primates; the function of the neural substrate for self-stimulation of the medial forebrain bundle; and the effects of electroconvulsive shock on memory. A chapter on the role of catecholamines in memory processing concludes the book. This book should be useful to researchers and students interested in the physiology of memory. IV. What Has Human Diencephalic and Bitemporal Amnesia Taught Us about the Nature of the Impairment? V. What Has Human Diencephalic and Bitemporal Amnesia Taught Us about the Regions That Are Affected?